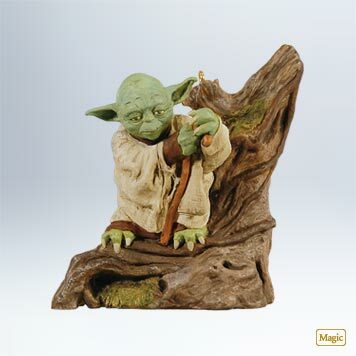 Ready for Hallmark’s 2011 Star Wars ornaments? It’s May, and as always, Hallmark’s 2011 Dreambook is out. The ornaments were on display at Celebration, but for those of us who weren’t there or somehow completely missed the Hallmark booth, this is the first look. Come July 16, you can pick up Jedi Master Yoda, Slave I, LEGO Darth Vader and the ever-controversial Showdown at the Cantina, featuring audio from the DVD edition. A fifth ornament, Bossk, will be available during the Keepsake Ornament Premiere. 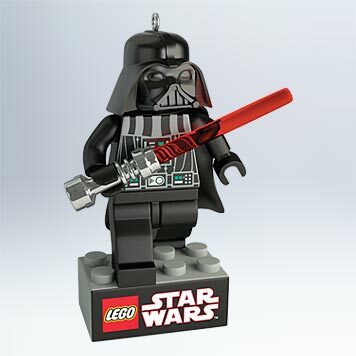 Other familiar franchises you can deck your trees with this year include Star Trek, Harry Potter, Wizard of Oz, Pirates of the Caribbean, several superheroes and… Twilight. All these ornaments will be available only in Hallmark stores. 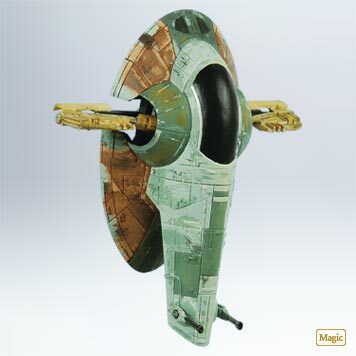 Nothing says “Merry Christmas, Love!” like giving the gift of the Slave I. All are must-haves to add to our collection. Great assortment! Slave I again? I do love Boba Fett’s favorite mode of transport, but I think I have a Hallmark version already. 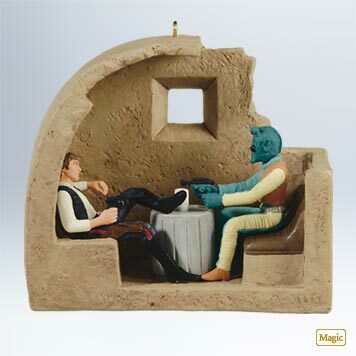 Han and Greedo? Han shot first. Duh! Color me disappointed . . . no sign of Star Wars miniatures, the only kind I collect. Wonder if there’s any chance they’ll come out later? 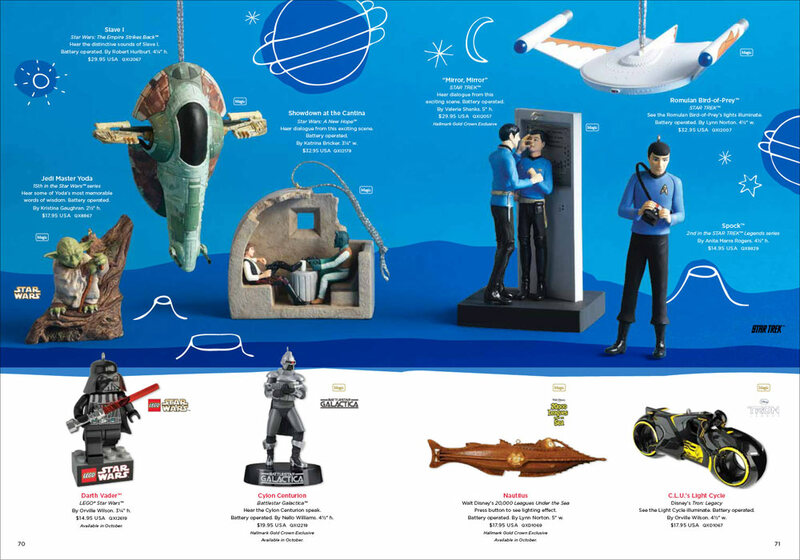 None of the Star Wars ones really do it for me…but is that the Nautilus from the Disney/Kirk Douglas 20,000 Leagues Under the Sea? It is? Oh, how my shriveled, cynics heart has been filled with childlike joy! I adored that movie as a kid, and it’s still one of my favorite live action Disney flicks. I agree, Beth. Why are we seeing that ship again? There are so many other ships we might explore. Or, say, other characters? the true meaning of Christmas: giving the gift of a blaster bolt under the table in a bar, because there’s no room at the inn. So awesome that they’re continuing the “INDIANA JONES” line. Between that and “STAR WARS”, Hallmark is flawless! Keep it up!